Congratulations to Connie Benson and all of our friends of Recreational Equipment Inc. (REI). They all must be beaming with pride and excitement since learning that Sally Jewel, their chief executive, is President Obama’s top choice for Secretary of the Interior. REI sales topped $1.8 billion last year under Jewell’s leadership and 3% of REI’s annual operating profits are allocated to these activities. REI was named “Best 100 Companies to Work For” for the 16th consecutive year by Fortune magazine. REI’s Connie Benson always calls upon Kahu Silva to bless her REI film crew each time they come to Hawai`i to shoot their product ads. 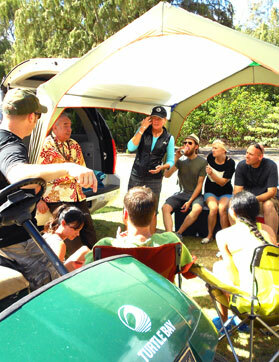 More than blessing all of the team members for their safety while working in or near the ocean and other remote areas of Oahu, the REI group enjoys listening to Kahu as he shares his knowledge about his Hawaiian cultural traditions, Hawaiian spirituality and traditional Hawaiian values. We pray that Jewell’s nomination will achieve Senate approval.